Dubai, UAE, January 30, 2019: Valentine's Day is just around the corner and so is that very special romantic dinner. While you concern yourself with getting all ready to impress, don't forget your delicate skin as there is nothing that boosts your confidence for Valentine's night quite like smooth and soft skin. And this is now even easier to achieve with Sukin's natural body care range. 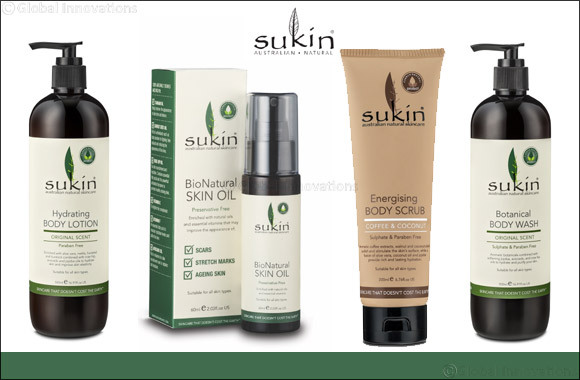 Formulated to restore the natural balance of moisture to the skin, Sukin's body range offers a simple and effective routine for hydrating, exfoliating and repairing the skin on our bodies. Ingredients such as Cocoa and Shea Butter, as well as Vitamin E and Avocado Oil work to lock in and replace moisture and intensely nourish and hydrate, leaving skin soft, smooth and glowing. The body wash is enriched with aromatic botanicals and oils to gently cleanse and purify the body without drying. A combination of Rosehip, Jojoba and Avocado Oils soften and lightly hydrate while Chamomile and Aloe Vera soothes the skin. The aromatic hydrating body lotion replenishes and nourishes the skin's moisture barrier through its oil rich blend of Sesame, Rosehip, Jojoba, Avocado and Wheat Germ Oil. Enriched with an infusion of Aloe Vera, Nettle, Horsetail and Burdock, skin is left feeling soothed and hydrated. The indulgent energising body scrub, utilises aromatic Coffee Beans and Coconut Shell to exfoliate, revitalise the surface of the skin and leave a polished surface. Aloe Vera, Coconut, Jojoba and Sesame Oils provide lasting hydration to soften and smooth the complexion. Added Rosehip and Vitamin E provide antioxidants to promote a healthy glow. Enriched with antioxidants and a nutrient rich blend of Jojoba, Tamanu, Rosehip, Avocado and Carrot Seed Oils, this skin oil, suitable for all skin types deeply hydrates and improves the texture of the skin, helping to reduce the appearance of scars and stretch marks and fight the signs of ageing. Added Vitamin C, E and F assist to brighten and encourage healthy looking skin. Sukin is available exclusively at LIFE Pharmacy retail outlets throughout the UAE, in Holland & Barrett Saudi Arabia and Boutiqaat in Kuwait. Sukin is also available in Lebanon at key pharmacies including Summerland Pharmacy, Arax Pharmacy and Express Pharmacy. Next Story : My Perfumes Revolutionizes with a never before Alcohol-free range of perfumes that are ever lasting.